The Melbourne Metropolitan Pennant competition gets underway this weekend with 46 clubs separated into six Men’s Divisions in accordance with finishing positions from the preceding season which sees this inter-club competition as arguably the toughest and finest run in the country. Women’s Pennants in Melbourne consists of two competitions, the Friday Pennant and Sunday Pennant and sees 34 teams competing on Friday with 30 on the weekend. 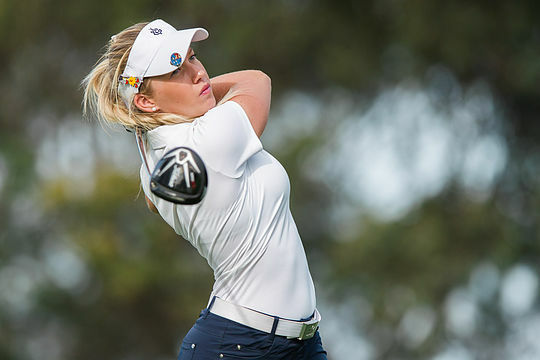 The ‘weekend’ pennant series will include many of Australia’s best female amateurs including Victoria’s Olivia Kline (pictured), Gabi Ruffels, as well a number of emerging VIS players. The Division 1 Men’s competition has always being arguably the strongest inter-club competition in the nation and this season sees defending champions Metropolitan spearheading a division that also includes Commonwealth, Peninsula-Kingswood, The National, Latrobe, Sanctuary Lakes, Royal Melbourne and Victoria. Metro will have the added advantage this Sunday playing at home as it hosts the Division and will meet Latrobe who were promoted from Division 2 last year. Royal Melbourne will meet former Division 1 Flag holders Commonwealth, The National will play Victoria, whilst Peninsula-Kingswood meets Sanctuary Lakes. In the Divisions of Men’s Pennants, each club is represented by a seven man “Men’s” team and a five man “Colts” team for Colts/Junior players. At both Men’s Pennant and Colts Pennant levels, the competing clubs are divided into Divisions with a promotion/relegation system in operation to determine the composition of Divisions for the following Season. The Pennant Season runs for 8 weeks with “Round Robin” match play contests between clubs at one venue in each Division every week. At the conclusion of the “Round Robin” contests, the two leading teams in each Division compete in finals to decide the Divisional flags. The Division 1 Final will be played at Keysborough Golf Club on the 21st May with the other finals venues determined upon completion of Round 7 also being contested on 21st May. Last year Metropolitan won the Men’s Division 1 Melbourne Pennant series the club’s first since 1987, defeating Royal Melbourne, 4&3, at the Spring Valley Golf Club. The remaining Divisions were won by Peninsula-Kingswood (Division 2); Rossdale (Div 3); Huntingdale (Div 4); Eastwood (Div 5) and Berwick-Montuna (Div 6). In the Sunday Women’s Pennant series, Victoria secured the victory over Commonwealth in a tightly fought final.